Video games never really touch on this long and sometimes heartbreaking journey that all of us go through at some point in our lives, so when I saw the trailer for Kitty Power' Matchmaker I was a little bit interested. While I was all for giving it a go I also saw the other side of it, with other people instantly distancing themselves from it and will never sample what the game had to offer. Sure this review will be ignored by most too, as the market for this will surely only be those who want achievements or those who like to play everything and anything. The question is, is that their loss or was they right to skip this game without batting an eyelid? Let's see what future me and 9+ hours of play thought after the weekend. 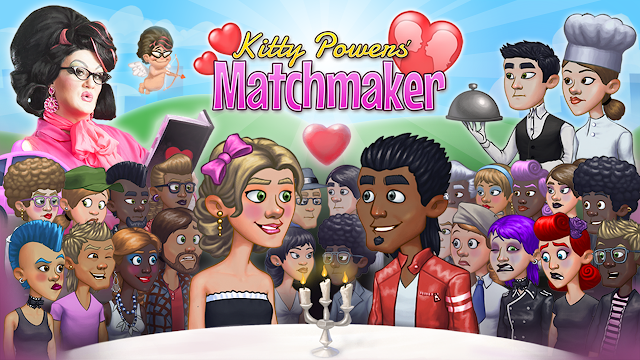 Kitty Powers' Matchmaker is essentially a dating simulator mixed with mini games that require memory, maths, and sometimes just a bit of luck. You run your own dating agency, with Miss Kitty Powers being your mentor and the one by your side as you start with a tiny agency and a dream of being the love guru to the masses. Soon enough single people are at your desk with the hope of meeting Mr or Mrs right, with your job being to find the guy/girl that hopefully will see sparks of love by the end of the date. Do this well enough and you will see youself earning some reputation, which in turn allows you to level up and upgrade the agency and unlock new things that will allow dates to have a lot more planning from you. The dates themselves always play out the same, with first looks being the thing that gets noticed, so reading up on the date to see what eye and hair colour they like is a must. Later on and by ranking up you can add things like a salon to your agency, which let you mess with such things before the date goes ahead. The shop also gives you access to some new singletons from the black book or Kitty Powers, while also giving you a few new restaurants to choose from for the dates. All these are bought with the cash you earn from the dates and elsewhere (finding hidden cats and pressing LT on the date end screen, or collecting coins that fly across screens mid-date being just two things), so doing well will not only see the agency grow in looks, but also things in the menus that will hopefully make the dates go the way you hope. Back onto the dates, and after those introductions are out the way you find yourself ordering for the other person after some instructions of what meal they would like. This is normally something like cold but with white or red meat, but also at times will have an extra of something like no wheat or mushrooms in it, so you need to study the 5 meals on offer and make the right choice. You can be told the ingredients for these meals by spending 20 coins on the question mark found next to it. Obviously, this isn't really needed when in an English or Amercian restaurant. But anything foreign and you're not a chef, this will be a great help to you. Each date takes around three minutes and will have three portions to it. The first portion is what I explained above, with the rest being you pulling the lever to the love handle fruit machine, with the machine giving you three topics to talk about, and the outcome either seeing love hearts flutter above your heads, or at worse getting a red x. In between these games you can try to lie by risking a spin of the wheel of misfortune, with a green tick getting you out of a tricky position, or a red x not going down well at all. As for mini-games I've seen so far, well the list is pretty short currently. I've had games where I've had to remember what our waitress looked like, one where I must pick the right desert after being shown a number of them in gameshow style speeding across the screen type affair, then some that have you doing some maths with the bill and also remembering a phone number for a taxi. You can see a date play out below rather than me sitting here explaining it. The issue that comes up with Kitty Power's Matchmaker after playing for an hour or two, is that you start to realise there really isn't much to it the longer time goes on. Because of that, I found myself loading up the game and doing three dates and finding myself wanting to go and play something else. So in regards to it being a game that will see you having prolonged periods of play on it, I very much doubt it. The fact that mates can find your player in their game to send out on a date is a nice touch, but unless you have a bunch of mates picking this up then both that and the leaderboards on the game are pointless. Well apart from some extra coin each week if you top it. Overall: Fun, but only in short bursts once the first couple of hours had passed. I reached a point around hour two where I just felt like I had seen and played everything that I could, with grinding for cash and unlocking new things being the only way I could bring new things into play. I've never been one to grind games, and what with money being needed on dates, it's very easy to blow what cash you do have within seconds, with the only way to earn some big coin is by going on yet another date.